Rosalie’s dress is from M and Co. We’ve actually had this dress before. I think we had it in size 0-3 last time round. I like this dress because it has an integral body suit built in so you don’t need to put a vest on underneath. Now Rosalie is on the move I try not to put her in too many layers. If I pad her out too much, she tends to be a bit stiff and can’t move as well. I’m looking forward to the summer when Rosalie can wear it sans tights and still keep her modesty. This dress is last season, I think it was bought in the sale. You can find this season’s version here. It’s rather lovely with the little bunnies. I may have to purchase this myself y’all know how I feel about smocking. Rosalie’s tights are from Sainsbury’s and her shoes and cardigan were handmade by her Grandma. 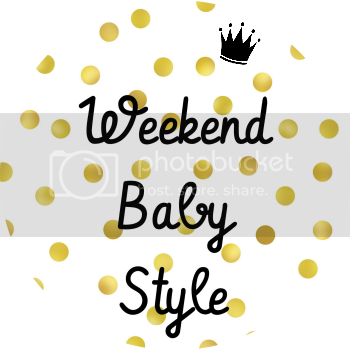 If you’d like to join in and share your baby’s weekend baby style you can do so by clicking here. Aw she is beautiful! There is nothing better than a baby in a handmade cardigan, so precious!